When you run a blog about home recording for almost eight years, it’s easy to get away from the basics. But as any football coach or guitar teacher will tell you, fundamentals are crucial. Whether you’re new to recording and haven’t recorded a single note or you’ve recorded a thousand songs, you need the fundamentals. Today I want to expand on one of the most basic principles for recording. It’s so stinkin’ easy to forget about this one, but it truly is the unforgivable sin of recording. This is a paraphrase of an awesome rant I heard Ronan Chris Murphy give at an event in California last year. He said there’s really only one way to ruin a recording. You could be recording Jimi Hendrix himself, and you accidentally record his solo from the mic across the room rather than the mic on the amp. You still captured a Jimi performance. You could be recording Adele, and you didn’t notice that mic stand you’re using came loose, and the mic was pointing at her feet instead of her face…but you still captured an Adele performance. You could be recording John Bonham, and you accidentally forgot to record-enable anything but the overhead mic…you still captured a Bonham performance. Those are examples of less-than-ideal circumstances to be sure, but none of those recordings are necessarily ruined, UNLESS…you do this one thing. What is the one thing that can ruin a recording? Clipping is the devil. Lots of things can happen during a recording session to cause problems, but clipping is the only one that will ruin the recording, and it doesn’t have to happen. What is clipping? Just so we’re on the same page, clipping is any time the level of the audio goes “into the red.” The waveform is so big (i.e. so loud) that it cannot get any bigger. So the loudest bits of the wave form get “clipped.” Instead of being a nice, smooth waveform, it has jagged edges. That’s clipping. And it doesn’t sound nice. More on that in a minute, but you get the idea. There’s a difference between a poor recording and a ruined recording. A clipped recording is a ruined recording. I heard of an engineer here in Nashville (I think maybe it was Vance Powell?) who hits record on his tape machine as soon as the band walks into the studio. While they’re setting up, getting levels and sounds, the tape is rolling the entire time. By the time they actually “record,” tape may have been rolling for an hour or two. Why do this? Because you never know when something magical might happen. The band may simply be “rehearsing” the song, and it might be amazing. If you weren’t recording, you missed it. What does this have to do with clipping? The point is simply this: Vance is concerned with capturing great performances. That should be our concern too, and while there are a million things on our minds in a recording session, not letting anything clip should be at the top of our priority list. After all, none of the other stuff we focus on matters if the track clips. Once it clips, it’s a goner. We might as well not have been recording to begin with. No one will give you an award for recording your tracks as close to clipping without going over into the red. The tracks sound no better at -1 dB than they do at -10 dB. True, in analog systems there was some benefit to recording things “hot,” to maximize signal-to-noise ratio and to get tape saturation. But we’re mostly on digital systems now, and a digital system will sound identical whether you record the tracks really hot or nice and quiet. In fact, digital clipping sounds way worse than analog clipping. Sometimes you can clip a compressor or a preamp, and it sounds kinda cool. Digital clipping ain’t the same. It’s harsh and cold and anything but cool. The good news is that every digital system I’ve used has a nice and easy way to tell you if you clipped: the red light goes off on that track. Do you find yourself always dancing dangerously close to clipping? Give yourself a break and turn everything down. Create a big, fat buffer between the signal and clipping. Musicians are notoriously inconsistent. And oftentimes they play or sing much quieter during rehearsal than when they’re actually recording. If you’ve set your levels conservatively, you’ve got plenty of headroom to absorb the extra volume without clipping. Otherwise, you’ll blow the first take, and the first take might have been the best take in the history of the band, but you set the levels too loud, and everything clipped. Clipping matters during mixing, but not as much. If I’m mixing something and my drum bus occasionally clips, I almost never hear it. It’s clipping inside my DAW, which has way more headroom than any of my outboard equipment. That said, it’s still a good idea to keep levels conservative. Turn your speakers up and your tracks down, and you’ll have a much more enjoyable mix. 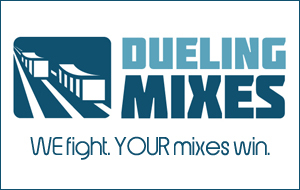 You won’t be constantly chasing down the culprit that clipped your mix bus. Everything will have plenty of headroom, and your mix will still sound great. Remember that album I was talking about earlier? The one that clipped on the big downbeats? If I had to guess, I’d say this was a mastering problem. Someone got bitten by the loudness bug, and rather than using his or her ears to see if the master sounded good, he ran the mix through his Super Duper Loudness Maximizer 2000. Did he get it loud? Yep, sure did. But it clipped. At least on that one song it did. Don’t let the robots tell you when your music is good. Use those ears God gave you. Trust them over meters and software. I know I used a lot of words to simply tell you “don’t clip your tracks,” but it’s good to hash these things out. It helps remind us of what we do and why we do it. We’re beauty capturers. And I want to save you and me both from ruining that beauty while it’s being captured. I’d rather safely capture it and share it with the world than aggressively capture it, only to realize I ruined it…and now no one gets to hear it.